Don’t get me wrong; protein is an important part of everyone’s diet – and especially athletes’. Dietary protein is broken down into amino acids that assist with everything from digesting food to repairing body tissue in the body. Not to mention that protein is another source of energy for your body to burn, providing 4 calories per gram. Both plant-based sources of protein (such as beans and peas, nuts, and soy products) and animal-based sources (such as meat, poultry, seafood, eggs, and dairy products) can be part of a balanced diet. The 2010 Dietary Guidelines for Americans put a special emphasis on getting dietary protein from seafood, which is rich in omega-3 fatty acids; and from cooked dry beans and peas, which provide ample dietary fiber. Click here to learn how InsideTracker can recommend high-protein foods based on the results of your unique blood test! Carbohydrates provide the body’s primary fuel while it is in motion, while protein is more important to aid in post-workout recovery for athletes. Protein is primarily responsible for repairing exercise-induced damage, and promoting training-induced adaptations in muscle fibers such as the synthesis of new proteins involved in energy production. Protein also facilitates the replenishment of depleted energy stores, preparing your body for its next bout of activity. Vegetarian athletes can certainly obtain adequate dietary protein, but they may have to be more diligent. Animal-based proteins are known as “complete proteins” since they provide all of the amino acids that your body can’t manufacture on its own (called essential amino acids). 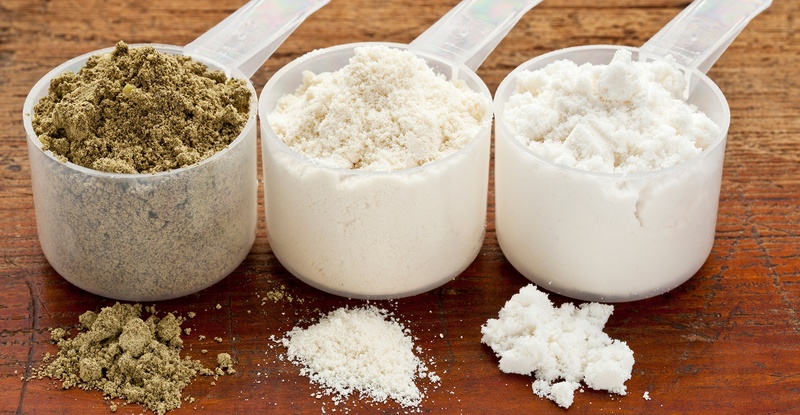 An incomplete protein source is one that is low in one or more of the essential amino acids. Complementary proteins are two or more incomplete protein sources that together provide adequate amounts of all the essential amino acids. Many plant-based sources are incomplete proteins, but two complementary incomplete proteins can provide enough of all the essential amino acids when eaten within the same day. This explains rice and beans - together they make a complete protein (not to mention a delicious side dish!). Many athletes have misconceptions about just how much protein they need to achieve their peak performance. The truth is that lifting weights, doing push-ups, and other forms of resistance exercise are actually what builds and strengthens muscle, while food is used to fuel, rebuild and repair it. The Recommended Daily Allowance (RDA) for protein in healthy adults is 0.8 gram per kg body weight per day (that’s an average of about 46g/d for women and 56g/day for men). Strength and endurance athletes should aim slightly higher; the American College of Sports Medicine (ACSM) recommends endurance athletes consume about 1.2 to 1.4 grams of protein per kilogram of body weight per day, whereas resistance and strength-trained athletes should aim for 1.6 to 1.7 grams per kilogram of body weight per day. According to the American Dietetics Association, most athletes consume an adequate amount of protein in their diet without the use of protein bars, shakes or powders that may add unwanted sugar or fat. For many athletes, the timing of protein consumption may be just as important as getting enough protein to promote muscle recovery. Research suggests that athletes who engage in strenuous activity should consume a meal rich in amino acids (proteins) and carbohydrate soon after each training session. While it’s tempting to subscribe to the ‘more is better’ mentality, no scientific evidence suggests that protein intake exceeding 0.9 gram of protein per pound (2.0 g per kg) provides an additional advantage in muscle building, according to Sports Nutritionist Nancy Clark, author of Nancy Clark’s Sports Nutrition Guidebook. Additionally, there is no evidence that taking a protein supplement on top of an adequate diet will enhance muscle strength or size. On the contrary, consuming too much protein can take a toll on your body. Breaking down proteins requires more water than breaking down either carbohydrates or fats due to increased water loss in the creation of nitrogen. Consuming protein in excess of your body’s needs puts you at risk for dehydration, which can severely hinder athletic performance. Increased protein metabolism has also been linked to increased calcium loss through urination. Female athletes should be especially careful about following high protein diets since they need to maintain calcium stores to preserve bone density. It’s also important to pay attention to the source of your protein. If you’re turning to animal products to raise your protein intake, you may be putting yourself at risk for high levels of ferritin, a blood marker for iron measured by InsideTracker. Animal protein contains heme iron, the type that is three times more easily absorbed by your body than plant-based iron (non-heme), making it easier for you to exceed your body’s needs. High levels of ferritin have been shown to harm your organs and tissues, negating any positive health benefits from protein consumption. Keep in mind that bulking up on animal products can also raise your intake of saturated fat and cholesterol, which carries additional health risks. Moral of the story: put down the protein powder and step away from the blender! If you’re eating a balanced diet with a combination of plant and animal proteins (remember: think beans and seafood! ), chances are that you are meeting your body’s protein needs. If you’re not sure, keep a food journal for a few days and calculate how much protein you’re already consuming, then use InsideTracker’s Nutrition page to find ways to adjust your intake if you’re not in your optimal range.